Alas, our Halloween box for 2012 was a little late, so I couldn’t do a lovely thank you on the 31st October to Warner Bros. It didn’t matter for the kids as they were still highly delighted with the box of goodies. I’ve said it before, and I’ll keep saying it that kids never get too old for things like Scooby Doo and Ben 10, even if they pretend they are. We have a birthday boy on Guy Fawkes night, so the boys are saving their bottles of bubbles for then. Thank you Warner Bros. for remembering I have three boys and for sending three bottles of bubble maker. The boys have decided the cat mask was a little too girly, so it is being donated to our local special needs school, along with the Lego Hero Factory movie after my boys have watched it. That means something for the girls, and something for the boys. I’m sure they will absolutely love a wee gift. Our box was missing the stickers so we couldn’t make any Halloween cards, but the boys didn’t know the stickers were meant to be there, so they’re still chuffed to bits with movies, sweets and bubbles. A couple of the movies have Ultraviolet, which is new to me. 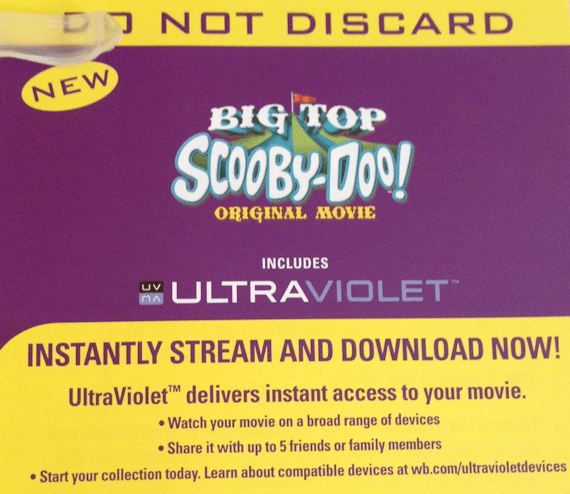 Ultraviolet says that the movie can be instantly streamed and downloaded with instant access to the movies on computers, tablets and smartphones. It can also be shared with up to 5 friends or family members. I signed up by using Facebook to join Flixter and then was able to download the movie. Adding a movie to a new account was pretty simple, and it means that I can play it on my iPhone, iPad, Android devices, and store it in the cloud. There are apps on iTunes and Android markets to get to our movies, so it seems a much easier way that actually taking up loads of space on our devices to keep them there. Playback looks easy enough, so it seems a great way to keep movies to hand to watch over 3G or wifi. I had no idea this even existed, and I can imagine I will look out for it in future. Thank you again to Warner Bros. Your packages always make for a lovely surprise arriving at our door. If anyone is interested in buying any of the movies, they are all available on Amazon, at really good prices.